The SBA has identified that more than 10% of students faced academic problems resulting in them having to repeat a year. The “immense pressure” of being an NLU student, which can also be caused or exacerbated by a variety of other factors, can take a serious toll on the mental health and well-being of students, two qualified psychologists and campus counsellors advised the students in the report. The SBA called out an “urgent need for reform” in its report, but declined to comment further when we contacted it, saying that the body was currently in negotiations with the administration with proposals to improve the situation, and was hoping for a positive outcome. Outgoing vice chancellor Venkata Rao has not been reachable for comment at the time of publication. The report, a copy of which we have received from sources close to NLS, makes for worrying reading, but it’s also a much-overdue and brave introspection by a student body about a topic that is rarely spoken of publicly in national law school culture, which can place inordinate value on ‘success’. Those that don’t succeed, by those strict academic or career yardsticks, can sadly fall between the cracks, which even college counsellors are not a panacea for. Out of all 400 NLSIU students (five batches of 80 each), up to 45 students have been forced to repeat a year in the 2017-18 academic year due to academic performance, such as failing exams, according to “final promotion list” figures analysed by the SBA. 8 third-years lost a year in 2015-16. If figures were compiled according to the “provisional promotion list”, which is subject to re-takes of exams, this “would reveal an even more stark contrast” the SBA’s report noted: in the academic year 2016-17, for instance, third-year students saw 13 year-losses, according to the final promotion list, but the provisional promotion list includes 27 students facing potential year losses - more than double the final number. On top of that, on average, around six to seven students - nearly 10% - leave each batch of 80 students over each five-year course length. 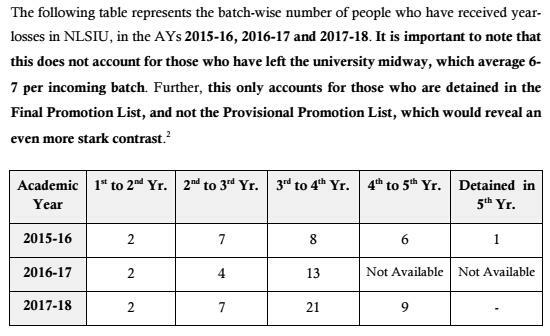 The SBA also compiled year loss statistics for Nalsar Hyderabad, NLIU Bhopal, NUJS Kolkata and NLU Delhi, which are also worrying, though lower than NLS’: an average of between 8 to 12 students annually lost years in their studies, across five batches ranging from 400 to 640 students (see table below). Such detentions can take a major toll on the psychological well-being of students, two college counsellors briefed by the SBA noted in the report. “Faltering in one trimester” can cause loss of motivation due to “mounting anxiety”, emotional isolation, eating and sleeping disorders, self-harm and “talking suicide”, wrote one of the counsellors. The prospect of losing a year “can be panic inducing” to a student and can result in “shame, humiliation, loss of self-esteem and confidence”, making it difficult for them to “bounce back”. “The prospect of sitting with juniors and losing friends who were batch-mates, doesn’t help either,” she added. A second college counsellor agreed that the “repercussions of a year loss” become “unimaginable” to students, and can cause “spiraling in negative cognitions, getting further demotivated and developing an over all sense of avolition” (a decrease in self-directed purposeful activities, such as hobbies or social activities). This can cause “feelings of worthlessness and hopelessness”. Those statements are backed up by the numbers: 40% of the 45 detained students from 2017-18 had lost more than one year: 9 had lost two years, 2 had lost three years, 5 were on their fourth loss of a year, and 1 had lost a sixth year of study. As illustrated above, the system of promotion is defective, in so far as it fails to account for the mental health effects on the students. The system is not conducive to the well-being, both physical and mental, of any student. Those students who find themselves entangled in this vicious cycle of repeated year losses find it difficult to escape the loop. This may manifest itself in various forms of mental illness, driving students to the very edge. It has been seen that this may also lead to students taking extreme steps, as a consequence. But the problem is not only academic. One of the counsellors pointed out that starting out at a college like NLS, adjustment difficulties can also be “emotional, social ... and financial”, which can affect every student in different and unique ways: “The hectic pace of the course schedule, the need to participate in different co-curricular and extra- curricular activities, ensuring that they have a good CV, the competitive nature of the Institution in general leaves them with conflicting emotions and self-doubts. The second psychologist echoed this, stating that “one of the most prevalent conditions experienced by most of the students I meet on campus is stress and inability to adapt and adjust to new and different environment”. The dropouts are often people from quotas. Same story at IITs. Politicians think giving certain people quotas will alleviate them, without understanding that it is making things worse. At least impose a basic CLAT cutoff + make them undergo a 2 year bridge course to improve their English. It's ok if a someone with a score suited for GNLU or HNLU merit list makes it to NLSIU through a quota, but if someone cannot make it to any NLU at all and is weak in English, how will such a person cope? This isn't really true. People have left here for a wide-range of reasons, social, disciplinary, even moving to other areas of study. It's a narrow-minded generalization to say that it's the people from quotas dropping out. You only need to look at the number of people you are looking down upon being placed in the big firms (assuming that you will be satisfied with this level of 'merit'). In the outgoing 2019 class you will see almost a large chunk of people getting hired from all the quotas (assuming they sat for placements) people look down on (domicile, foreign nationals, SC / STs). People have done well, although I agree that the college can do more for first years to help with language issues. It would be interesting to see real statistics on this. Don't know whether itmay be politic to do so, though. I agree with the bridge course idea. The only way to elevate "weak" students is to bridge the gap so they can compete. Another alternative is to make exams bilingual, if English is the sole problem (as are conducted in many traditional colleges). Arguments and critical thinking are more important skills, especially for those who are not intending to practice in the Supreme Court. This is spot on and kudos to the current student body for raising these issues. There were discussions at NLS about moving to a 5 day week/semester system even 6-7 years ago to ease academic load and leave time for other activities, but the overwhelming status quoist response was that we would lose the 'rigour' we were known for. Not sure why a timetable and a trimester system was even considered the site of our academic rigour. Hope these reforms are carried through. This is a tricky one. Having weekend classes allows the benefit of practicing lawyers being able to come in and take guest lectures. I dont know how many NLUs have practicing lawyers take such classes on weekends but it used to be quite common in NLS, NALSAR etc. about a topic that is rarely spoken of publicly in national law school culture, which can place inordinate value on ‘success’. Says Kian Ganz, the man responsible for hyping law firms before students, while giving very little coverage to lawyers earning less but doing wonderful work in advocacy, public service, activism, academics etc. there are plenty other other websites doing the kind of reportage you want. you are always free to free to read them. I'm not sure how this is relevant here. To do anything, you need to graduate. For that you need to pass your papers. It's not a law firm versus practice or academia thing here. Students are being found to be unable to finish the basic requirements. Now that can be a combination of wrong career choice, CLAT being inadequate as an exam, inability to simply put on requisite effort, faulty system or any number of other things. But what you do after graduation with your law degree is irrelevant in this context. Or are you saying knowledge of law is only required to do law firm jobs? Sure, by the looks of it, it's not hard for you to go through law school or that's what you claim/believe in. Let's not generalize here. Please don't bring the so called 'tougher institutions to get into, the IITs' into this discussion. Btw, most of my friends are IITians and they believe that the only thing that was hard was the entrance exam and not the academic rigour there -but anyway, who are we to judge any of that again. Correct. Law students complain too much. Too pampered. One cannot possibly claim law school academic rigor is getting tougher every year, because it is not. On the contrary, academic standards see a worrying drop overall across all NLUs. Reports like this highlight the increase in number of students failing a year, but they are not in a position to consider to what extent that is because of the fact that students no longer consider it important to spend a bare minimum of hours every day to plain and simple studying. Law school curriculum is supposed to be tougher than regular graduate studies! I'm not rejecting the need for law schools to improve upon the mental health support system inside, that's very much a need. But relaxing the academic standard even further is patently ridiculous! This is not school life, passing a paper with all these internal components is still fairly easy for those who are willing to work hard. So if you think that sitting with the juniors would scar you for life, you should ensure that you are spending a sufficient number of hours studying so that it doesn't come to that. I'd want a premier NLU tag, but will not or cannot work hard enough for that isn't any argument. I also agree with this practice of filing NLU seats with students scoring in single digits in CLAT even, to cater to the reservation. I've actually known students to have scored 8/200 and still get called for a mid-rung NLU. To expect that person to cope up with the studies there is in itself expecting a miracle! If universities have tyrannical VCs and incompetent professors who hide they inadequacies by overburdening students with work, grading harshly and acting as moral policemen, what else do you expect? Overburdening students? By whose standards? The institutions have a standard to maintain. If students feel they cannot cope up with it, then they should not go there or drop out. Law school, Med school are supposed to have their share of drop-outs. Blame the parents who send kids off to study law without figuring out whether they have the inclination or the aptitude for that, blinded by the supposed glamour of 18+lakhs annual salary! Actually, med schools world wide have the lowest dropout rates anywhere in the world. 4. Hiring NLU alumni as faculty through IIT-level payscales and abolition of UGC NET requirements. NLU students have supposedly formed a students consortium, but it does nothing. 1. You have 35 marks for projects in which, unless you really marked yourself out as a jerk in class, you should get 20 marks without a superlative effort. 2. You have 5 marks for attendance, in which you have no excuse to not be getting 4 or 5 on a regular basis. 3. You have 60 marks for exams, out of which, if you have done the bare minimum on the above, you need only a 25 to pass. Sure, you could end up a bit short from time to time, but not enough to lose a year. I had to repeat the final exams for three subjects in five years (different from repeating the course or the year itself), and all three times I knew the fault was completely mine. I slacked off on attendance, I submitted a crappy project and I didn't really make an effort for the exams. Granted, there are students who may come from backgrounds where they are not able to cope with the large amount of reading required, or are simply not able to get into the groove of the discipline required to pass subjects. However, it is by no means a superlatively difficult task. Everyone I know who has repeated a year or several years eventually graduated saying that this was just my stupidity, I wish I had set my priorities straight in the beginning itself. In general, maybe it would be helpful for students to have it drilled into them at the time of admission that DO NOT lose attendance marks, give REASONABLY good projects, DO NOT be a jerk in class, STUDY for your exams instead of spending nights on the terrace drinking and/or being involved in committees that have no value in the future. That said, there definitely needs to be a support system for people who cannot cope for reasons other than just taking far too many liberties with the freedom they've got after 18 years of home life. However, 20% of a batch is not representative of the people who *need* support. A large proportion likely thought college would be a cakewalk and the trimesters hit them before they knew it was not. PS. And also tell them they need to watch out for CPC/DPC - that's why you have so many issues in the 3rd and 4th years. Attendance marks? How about treating students like adults and judging them only on their performance? But yes, if 40% of the marks is based on continuous internal assessment, it is rather difficult to fail. That said, quite a few people who haven't been to the better schools, are taught to answer (copy off) what's in the text books. It can be a culture shock for students who are not only expected to reason for the first time, but also understand that plagiarism is bad. This does not mean that these students are stupid, lazy or not serious. Indeed, even lack of effort can stem from the feeling of exclusion, depression and hopelessness. Does this mean they should be passed even if their work is shoddy? Obviously not. But, in such cases institutional guidance and mental health support should be accessible. As a 2010s product of Law School, I agree completely with NLS Grad. Law school is passable, provided you don't lost sight of the minimum benchmark, which needs some effort. The vast majority of courses can be cleared if you submit half-decent papers, study at least in the week of exams, etc. But if you're in that category YOU have to make some choices - such as reduced social activity, selective or minimal committee work. I'm sorry if you feel left out of the "scene" but those are the privileges you get, if you're working hard or otherwise managing your responsibilities (some people just coast, on intellect or ability; I sure couldn't and made several sacrifices to earn my progress). I'm also aware that some of the people currently trying to coast on this serious concern of mental health, are doing so just to save their own skins - people with 7-8 carries (owing to not giving exams, shortages, plagiarised projects etc) who have rightly been detained in their years and not promoted [if even RVR doesn't think you should go the next year, that means you've really not earned it]. Yes, there are some people who may find it hard to cope. And Law School needs to have the right support systems like better mentorship, medical support etc. But a lot of people are in this position because of their own doing. The solution isn't some attempt to push down academic standards at all, rather to help people cope better. As for marginalised groups, yes. Chances are that most failures are from these communities, but that's only because the intake is also skewed in favour of those who got higher ranks in the entrance. This is an age old question of affirmative action, not being a perfect solution. Because sub-par people (possibly not for any fault of their own) are made to compete with people who are relatively more privileged or more intelligent. But the buck has to stop somewhere. Law School is to build lawyers, with some accommodations in entry for disadvantaged groups. Law School shouldn't exist to keep that crutch forever, and lower its benchmarks on excellence. And this itself is funny because not all courses or faculty are even half decent. You can very well manage to clear, if you accumulate enough credits in those courses and maybe take a repeat or two in the tougher courses. Under RVR by the time I left, you were given 3-4 attempts at a course (and for up to 5 courses even) to try to pass. If you don't make that effort at least, or can't, then maybe Law School isn't for you. PS: I think Professors Reddy and Pillai have retired, so maybe 3rd year isn't the same herculean (and possibly mundane) task it was anymore. You are correct, I believe Prof Reddy and Pillai are no longer there. Pillai's courses weren't really tough to pass either, more than 1/3 of his paper was one mark, one line answers directly from the bare act! All you had to do was read the bare act a few times and know where everything was to score full marks in that section. I digress, though, individual courses are not the subject of this discussion. Law school offers so many opportunities to pass your subjects, when I graduated in the latter part of the first half of the 2010s, students were being given special repeats and special special repeats to enable them to pass! The only people who couldn't take benefit of this were those who had massive attendance shortages - and there is no logical excuse for that. Even for medical cases, the exam department is very reasonable - it's the cases where people are already borderline due to their own fault + get medical issues is when the exam department can tell you to get lost. And to be honest, I support them in that. I had a marginal attendance shortage once in law school (by a couple of hours), all other times I was 0 or 1 in attendance but never short of the minimum. Exam department didn't even put my name up in the list of people with shortages at that time. In any case, I think everyone who has graduated in the last 10 years knows this story - you have your priorities straight, you can have fun and pass comfortably. This is true for more than 95% of people. The rest who have genuine issues, there definitely needs to be some kind of support. @NLS Grad: Ah, sounds like we might even have shared classes together. But as someone still somewhat knowledgable about happening at Law School, I think some things have changed. The unbridled student friendliness of early Venkata Rao seems to have been tempered to a certain degree in the years since our time. So maybe it's not as routine to clear as it was for us. But whatever the change, it's still marginal. It is still quite possible to finish Law School as long as they do the bare minimum. As someone who left free marks on the table by not having attendance I only blamed myself when I had a tough time in some courses to safely hit 50. But that was on me. Not on ED or the teachers (bad teachers are a real problem, but that's not what left me at 48 in Criminal Law). I also agree than there will be some people who cannot cope despite a fair effort - either because of structural problems (for those, reinforce mentorship, additional classes, SBA guidance etc) or many with mental health issues (not caused by law school, but tbh exacerbated by the competitive environment - for them, better counselling can help). The recent alumni initiative to talk to current students on an ongoing basis sounds like a good idea. Having said that, a lot of the failures are still self-induced in an environment that is already granting a fair amount of leeway. So, no dice, to those hoping to capitalise on the recent tragic suicide (which certainly merits more introspection on mental health issues) to try to get more condonations out of the admin. It's unlikely to fly, especially with senior academics (law schoolites at that, like Rahul Singh, Sarasu etc) being involved. Sorry, had missed this. Now published. NLS grad and Another Grad has nailed it and I fully agree with everything that they have said. Let me add a bit more. I do see that there are people with genuine mental health issues and many of them accentuate under stress. There is one more aspect that we forget to add- the drug and alcohol problem. Now before you pass me off as a moralistic guy passing judgments, please remember that both drugs and alcohol when added to stress and proneness to mental health issues results in a terrible soup. Law school has a high level of tolerance for soft drugs and alcohol and its even a part of the 'cool' kids narrative or the general set of excesses in life that law school tends to lionise. As much as the SBA has prepared a good set of reports and recommendations on mental health on campus, the drug/alcohol problem has received no attention at all. And this is where I start to doubt the existence of any 'good faith' in this entire exercise. all those reports identify problems with the faculty and the university admin (no doubt some of them are real and requires to be addressed), but fails to do any introspection and identify what could be wrong with what the students are doing (yes, there is some mention of the lack of community support, but thats pretty much it). I am starting to doubt the real motivations behind this movement and who exactly sponsors it because most of the demands appear to just make a case for reducing the academic rigour of law school (which is nothing comparable to what the premier law schools in the world throw at you). Stop moaning, you spoilt kids. Generations before you have studies much harder, some at a time whether was no internet or Google. Also, your counterparts studying STEM subjects work 10 times harder. Stop spending time Facebooking and watching movies, start studying! I thought with Venkat Rao these guys must be having a really good time. He ensures everyone passes. If you can't make it with all the revaluation etc., then these kids need to do serious introspection as to whether the profession is for them. There are too few jobs available, creating pressure. Allow foreign law firms now! Stop making kids think CAM and SAM are the only options in life. Even teachers nowadays can get close to 1 lakh starting + subsidised housing, which is more than a litigation salary and enough to pay back study loans. Places like JGLS pay even more and give preference to NLU grads. You don't have to do an LLM abroad. You can do it an NLU for much less. Suppose a person has a BALLB from an NLU plus an LLM from an NLU. He or she can get hired as a teacher at an NLU at close to 12 lakh pa with on-campus housing, and repay study loans comfortably. There should be an initiative to fast-track NLU alumni into teaching this way. The government has recently waived UGC NET for people with degrees from the top 200 foreign universities and top IITs and IIMs. A similar exemption can be given to those who do their BALLBs plus LLMs from an NLU. This can create many new jobs and improve the standard of teachers. 12 lakhs pa plus subsidised housing! Under the 7th part commission, the basic pay scale for an assistant professor is 63000/- plus 9% DA (5600+) and around 5000 to 7000 TA. That's 75000/- gross pay at the maximum. If you get housing then you aren't eligible for HRA. From this deductions of 8/12% EPF are made (7000-8500) and 6000-7000 TDS. This leaves you with 60000/- in hand per month. That's well short of 12 lakh+ pa.
JGLS does pay better and so do some (only a very few) private institutions. This is crazy. I graduated from nlsiu and it's no walk in the park but nor is it that hard. Law schools abroad are way harder n more competitive and if you can't hack it, this just isn't for. Nor is people "losing years" such an unfair problem. You didn't study enough .. you fail. Life tends to work that way! Two suicides happened around my time too but we all knew there was no link with academic pressure. It was tragic but a medical issue and one that unfortunately no one on campus was equipped to recognize or help with. Now THAT is something that does need to be addressed. We got a campus counselor briefly but she was comically terrible! The next VC will almost certainly be an alum, so the student's concerns will be heard then. On the contrary, if it is some one like Sudhir, the party will end. They are going to have buck up or leave. People in law school fail courses for different reasons. Some completely self-made and a result of lack of effort. Others for no fault of theirs (eg. medical, socio-economic etc.). While it has been some time since I was in law school, I gainsay that the majority are the first category and do not merit any special institutional support because but deserve to be provided a chance to rectify their errors and redeem themselves. The second category needs institutional support to identify and address their shortcomings as well as the underlying cause. The problem is that while some such mechanisms like medical attendance makeup etc may be in place, they are abused by the first category and this makes it difficult for genuine cases in the second category. The institutional failure here is in not being able to segregate the first from the second but that's not an easy task. Spot on! Couldn't have said it any better myself. As the Nalsar Sadhguru episode showed, NLU students are just lazy and arrogant. Don't blame it on mentaller health when this hits you back. The best career option is to start a legal news website. You just need to reproduce law firm press releases, mainstream media reports and gossip from law schools leaked to you by students. Then, use clickbait headlines and stoke rivalries between law schools. You can earn lakhs of rupees doing this. Piece of cake. Jindal has 40 to 50 NLU alumni as teachers, but NLUs prefer hiring teachers from obscure colleges. Could it be that NLU alumni are indeed applying for teaching jobs at NLUs, but they are being deliberately rejected by certain VCs? Quite possible. Have seen some instances at leading NLUs myself. Although being an NLU alum isn't any guarantee of quality teaching ability. And JGLS doesn't have that many. If you consider percentage wise, it has approximately 25% of its faculty made up of NLU alumni. So does NUJS incidentally including the ad hoc people. NLUD was building up its strength in that direction, but now has hardly 4-5 people. But JGLS has the advantage of not requiring UGC qualification, so they can pay good salary to more people. We need some authentic stats on this. NLU alumni must get into teaching, and it can also reduce placement pressure on NLUs. Search LI. Someone had provided exact stats of NLU alumni teaching at NLSIU, NALSAR, NUJS, NLUD and JGLS in the comments section sometime back. The numbers were around 4, 3, 8, 4 for the NLUs. I forgot the exact number at JGLS, but was around 10-14 of teaching alum. Which isn't that high considering JGLS also has much higher faculty number overall. Right now, NLSIU has the highest number of alumni in the faculty (including non-remnant profs and adjunct profs teaching regular classes). @Nomi: Please cite a number (and if it's more than 8 then the names). I never knew NLSIU to ever have 8-plus NLU alum as teachers in their rank at a time unless you are counting those offering occasional credit-courses. I have often seen some students (mostly from rural areas or tier 2 ) suffering from a cultural shock during their first days in law school. Have also seen some of them get an inferiority complex , lose confidence and even get into circles where substance abuse is common. Wish there was someone to give them some guidance when it was needed. It seems to me that the media and some commentators (who may not be familiar with the law school experience) are maybe making wild generalisations. I don’t recall my experience in law school being stressful from an academic perspective but that’s my experience. Equally I have had dark moments which were in no way linked to academic pressure. I don’t think a one size fits all solution can apply to mental health issues and that’s exactly what a proposal to relax academic standards is. Are we suggesting that students who are doing well academically don’t get depressed or that an o in each course is the key to happiness? Each student will have her own stressors and it is imperative that other students keep an eye out for signs of trouble. This movement for making academic life “easier” is ignoring the real issue of students feeling isolated or alone in their troubles. Maybe the solution is to bring the law school community closer - encourage interpersonal interactions both among students and with alumni. If someone felt so alone in a small campus of 400 people, then we are to blame for our apathy, not the system or the institution and we should strive to do better. Guys. I found the posts being referred to, about faculty ranking in NLUs. I have pasting them below. They were posted by the user "Further Nerdiness". I have also linked the original thread below. I have carried on further nerdiness to include NUJS & Jindal [only assistant profs] working on the same methodology outlined above. I included NUJS as someone specifically asked for it to be included, and Jindal because it is widely perceived to have the best. Limitation vis-a-vis Jindal: I started out checking the assistant profs (as when I had only provided details for senior faculty initially someone took offence), but got too tired going through all 70 of them and never got around to the Profs and Associate Profs (who I do believe would do much better). NUJS, NLU-D, NLSIU, NALSAR and Jindal [on basis of %age faculty members having publications noted on HeinOnline]. Editorial note: What surprised me is the fact that though Jindal is filled with faculty members coming from NLUs with foreign degrees at the graduate level, they haven't published all that much. As such, these are people who never put out a paper in a publication run by their institution during under-grad nor have they published their research carried out during the graduate study. This might seem a bit below the belt, but does seem like a case of quantity over quality. To keep with the tradition of recognizing people with greater than/equal to 5 points on my rather crude methodology, here are names for NUJS & Jindal (assistant profs only). Ooh, 'brouchers' gives it away exactly who has been commenting here from NUJS. Justice League alert! The last date for sending applications to the Search Committee is April 22, 2019. Applicants need to be below 60 years of age and need to have served as Professors of Law for at least 10 years. There is no scope for meritorious and right candidates to become VCs of NLUS. Below average or mediocre people who are neither good teachers, nor good researchers nor good human beings are becoming VC s in NLUs based upon non academic or external influences. If this continues a day may come when there will be open revolt in NLUS (already happening in lots of NLUs with student protests) or situation may ripen to close NLUS and merge them with local and traditional universities. For commenters 22 to 24: The NLSIU VC selection is delayed because of elections. You people are wrong is suggesting that Rao will get an extension, or that meritorious candidates will not get chosen. On the contrary, the selection committee is the best possible: MP Singh, Venugopal and Datar. MP Singh has told people the it is time NLU alumni become VCs, and he also promoted Shamnad and Sudhir to professor rank out of turn, to encourage young scholars. Datar is the other of an alum and is aware of sentiments among students and alumni favouring an alum as VC. Thus, be ready for acche din: a top-notch alum as VC, who in turn will hire other alumni as faculty. A student from NUJS has been insulted by the seniors based on his caste and these are his exact words - Surely, "NUJS is one of the top Law colleges in India. "Waha Niche baith ke baat Karo, tumhari vahi aukat hai". Not just this, but other phrases and words which are highly derogatory to my caste identity were spoken. They were so offensive that I can't even write them in public. Despite my resistance to it the boy was continuously abusing me and his voice and temper was so raised that I felt intimidated.....I was shocked at that moment. These remarks were made to me by a student of our college only. Because of this incident, I've been in a very bad mental state." This incident is shocking and insanely sad. Kian, why dont you cover this, instead of covering inane things like salaries and placements ? If we cannot make humans out of these students, why even have these esteemed universities ? Has the guy complained to the VC? Kian should report after that, based on the action/inaction of the VC.